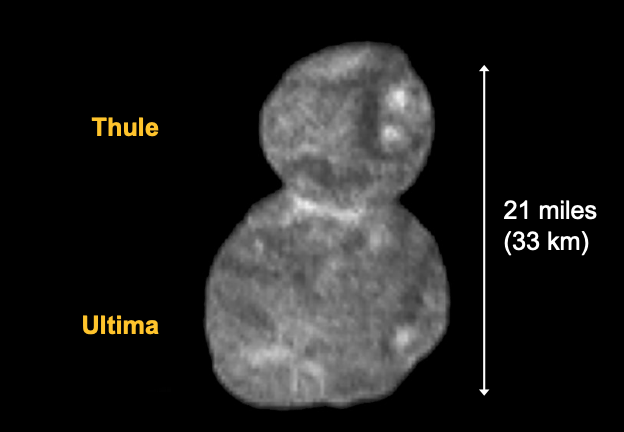 Risingbd Desk: The small, icy world known as Ultima Thule has finally been revealed. A new picture returned from Nasa's New Horizons spacecraft shows it to be two objects joined together - to give a look like a "snowman". The US probe's images acquired as it approached Ultima hinted at the possibility of a double body, but the first detailed picture from Tuesday's close flyby confirms it. It orbits the Sun in a region of the Solar System known as the Kuiper belt - a collection of debris and dwarf planets. The scientists have decided to call the larger lobe "Ultima", and the smaller lobe "Thule". The volume ratio is three to one. Jeff Moore, a New Horizons co-investigator from Nasa's Ames Research Center, said the pair would have come together at very low speed, at maybe 2-3km/h. He joked: "If you had a collision with another car at those speeds you may not even bother to fill out the insurance forms." The new data from Nasa's spacecraft also shows just how dark the object is. Its brightest areas reflect just 13% of the light falling on them; the darkest, just 6%. That's similar to potting soil, said Cathy Olkin, the mission's deputy project scientist from the Southwest Research Institute (SwRI). It has a tinge of colour, however. "We had a rough colour from Hubble but now we can definitely say that Ultima Thule is red," added colleague Carly Howett, also from SwRI. "Our current theory as to why Ultima Thule is red is the irradiation of exotic ices." Essentially, its surface has been "burnt" over the eons by the high-energy cosmic rays and X-rays that flood space. "[Ultima's] only really the size of something like Washington DC, and it's about as reflective as garden variety dirt, and it's illuminated by a Sun that's 1,900 times fainter than it is outside on a sunny day here on the Earth. We were basically chasing it down in the dark at 32,000mph (51,000km/h) and all that had to happen just right," the SwRI scientist said.